A French startup has created wireless charging stickers that adhere to the backs of smartphones, tablets and drones, among other things, and can charge multiple devices at the same time on a single charging pad. Energysquare, which was founded last year by two French entrepreneurs who had just graduated from an engineering school, launched a crowdfunding campaign today on Kickstarter hoping to raise $33,630 (€30,000) to ramp up manufacturing. Energysquare's pad charges a mobile device enabled by its sticker technology. Unlike today's most popular wireless chargers, which use electromagnetic induction, or resonance, to create a field through which electricity can pass between two copper coils - a transmitter and a receiver - Energysquare's technology uses electric conduction. The thin, adhesive sticker has a tail that plugs into the mobile device's charging/data port with either a Lightning or Micro-USB connector. and even USB-C type connectors. The sticker contains two electrodes that are linked to the device's battery. When the device is set on the surface of Energysquare's charging pad, which is made of conductive squares inlaid into an insulating material, the two electrodes are activated as soon as they're in contact with two different squares. "We have designed the surface and the sticker so that you can put your phone in any position, the two electrodes will still be in contact with two different squares," Energysquare CEO Thibaut Guédou said in an email to Computerworld. "Hence, the surface detects the device and energy is sent to the battery. The charge is not made through [electromagnetic] induction but directly through the contact between the sticker and the surface." Each of the charging pad's conductive squares are controlled independently by the company's embedded system, which allows the pad to charge multiple mobile devices with varying protocols. The charging pad becomes active once two squares are connected to a mobile device with a sticker. When the device is fully charged, the pad detects it and stops charging. The charging pad's surface will automatically detect a foreign metal object or water and will not send any energy through it without a sticker, Guédou said. "It is therefore possible to put any object on it and to wash it with water," Guédou said. "We've developed an open source standard to be compatible with all kinds of portable devices -- drones, wireless speakers, laptops, etc." For about $44 (€39), early bird backers can receive a SquareOne charging pad and five charging stickers of their choosing, whether for an iPhone, Android phone or tablet. Backers can also receive a SquareTwo charging pad ($66), which has a larger surface area for more devices. Energysquare's founders claim the conduction technology can charge with the same speed and efficiency as a traditional wall charger. All that's needed is to equip the smartphone or tablet (Android or Apple) with a small sticker, which has a tail that plugs into mobile devices via a lightning or micro-USB connector. Energysquare offers its stickers in a variety of colors. "The charge is made possible by the direct contact between the sticker and the [charger's] surface," Guédou said. 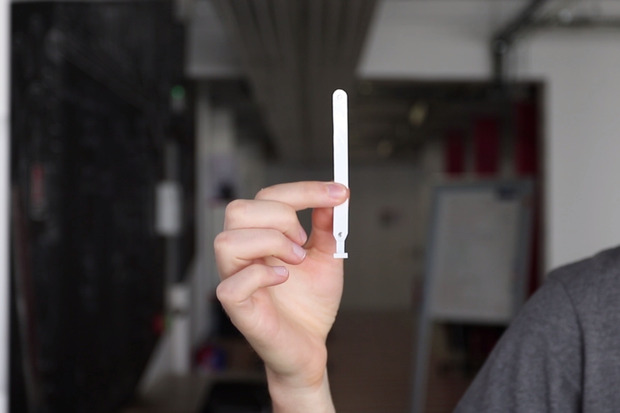 "It took us two years to complete a working prototype but our technology is now fully functional." Energysquare is not the first to look at conductive charging as a method for offering the "charging pad" experience, said David Green, research manager for power supplies and wireless power at IHS. "And it's a valid technology." The most prominent example of conductive wireless charging is the version created by JVIS USA, which later started the Open Dots Alliance to try and move an open source specification of the technology into the automotive environment, Green said. An in-vehicle wireless conductive phone charger from JVIS USA. This model is an aftermarket device sold on Mopar.com. "But traction for this type of technology is certainly limited compared to [magnetic inductive wireless charging]," Green said. Most electromagnetic inductive wireless charging technologies today require special charging cases, which have copper coils embedded in them to receive the electrical transmission. The strongest demand, highest customer satisfaction rates, and biggest volume of wireless charging-enabled devices, however, are for a charger that's embedded in the mobile device, as it is with the Samsung Galaxy S6 and now S7, Green said. "The whole idea is that you don't need to plug anything in, you just drop it on the pad and charge - there's no accessory," Green said. "Within the mobile phone space, the present and near-term future is clearly inductive - that's what [device manufacturers] are already integrating and the standard is either Qi or PMA (increasingly dual-mode to offer both)." The next step in wireless charging will be magnetic resonant, which allows more loosely coupled charging, so that a device can be a short distance (millimeters) away from a charging device. "That's expected soon and is already seeing some public infrastructure deployments of chargers in readiness," Green said. The long-term future could then bring the introduction of uncoupled systems using Wi-Fi and other technologies. The challenge for alternative wireless charging-pad technologies aiming toward mobile phones is that right now, there's no standard, Green said, and the technology would have to replace the incumbent technology of magnetic inductive charging. Guédou, however, said unlike the most widespread technology today, induction charging, Energysquare's induction technology doesn't require a "tight coupling" with a charging pad, and users can simply drop their device anywhere on it and it will charge. Additionally, Guédou said, Energysquare's conductive wireless charging loses far less energy (1% to 2%) than magnetic resonance. The average electromagnetic inductive charging technology has an efficiency rating of about 86%, meaning 14% of the energy is lost in transition. Each individual square of the Energysquare's charging pad can deliver up to 25 watts of power. "With the right power adapter, the small surface can deliver up to 200W," Guédou said. 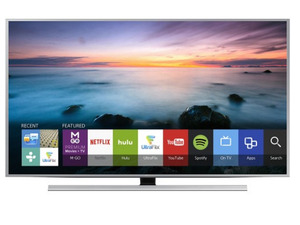 "Induction standards usually go up to 5W. The benefits are twofold: in the short term, we can put as many devices as needed on the same pad. In the medium term, we have the potential to charge every kind of electronic device: laptops, drones, wireless earphones, weather station, etc." 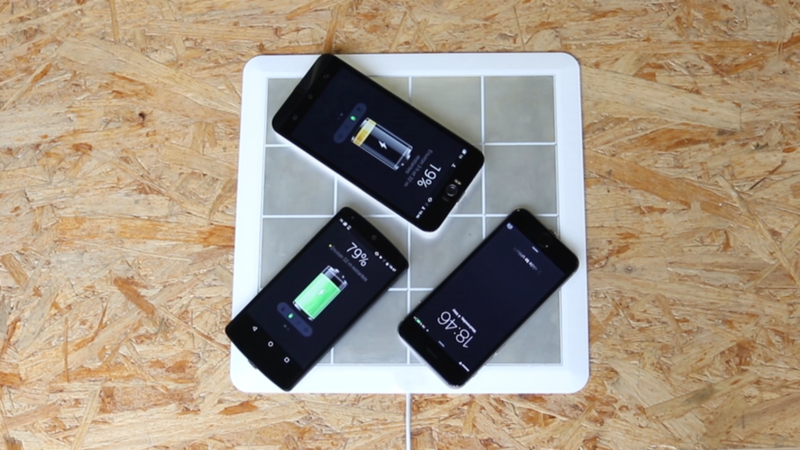 Energysquare's SquareOne charging pad charging multiple smartphones at the same time. Regardless of what technologies may already be in the market, Guédou said Energysquare's is superior in that it addresses the issue that most of today's mobile devices don't have native wireless charging - and this is a simple solution. "Our product development has been driven by the simple idea that our devices spend a lot of time on surfaces, so we want to make the most of that time," he said. "I think we can bring something completely different on the market." This story, "This sticker can wirelessly charge your smartphone or tablet" was originally published by Computerworld.